The annual pirates parade has been and gone this year with a bang! Cannons sounded and beads were thrown as families and friends cheered and watched the parade. January 26th marked the day of Gasparilla this year. Tampa Bay was filled to the brim with Floridians from all over the state. Many college students drove down for the weekend to spend time with family at the parade and go out with friends that night. 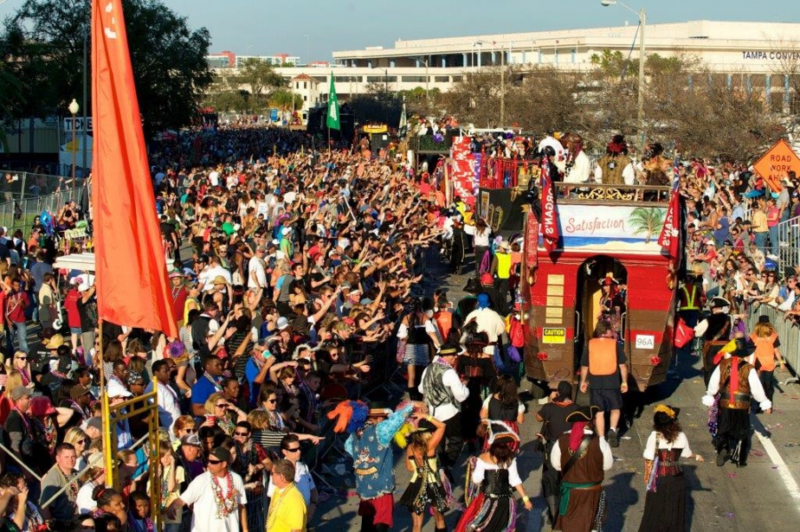 Gasparilla had lots of music and tons of beads. Standing on the sideline of the event were big crowds of people cheering and jumping to catch necklaces. It was a really fun experience, but there are definitely a lot of things I will do differently next time. One of the biggest issues was there being too many people. With large crowds and loud music, it can be really difficult to make sure everyone is accounted for. Within the first 10 minutes of getting near the parade, I lost half of my group and it took a while to find them again. As there were so many people, cell phone service was not working so we struggled to find my friends. Next time I would recommend assigning a meet up spot so that if the group gets split up, there is a final meetup destination. As the day went on, the temperature began to drop quickly. With the sun out it wasn’t too cold, but once we lost those warm rays and the parade ended, it was time to head home. As parking was too crazy, we had Ubered there, thinking we would simply get an Uber home. This did not go as smoothly as planned. No one could Uber within the event’s proximity as the event was so packed and traffic was so bad. After waiting an hour and trying to get multiple Ubers, we finally gave up and walked a mile out of the area to catch a ride home. A tip to avoid the strains of traffic would be plan ahead for a ride. Set a driver to either come pick you up or get a hotel within walking distance. All in all, Gasparilla was a success and I know how to make it even better next time!